Chia seeds. Oh, do I love them! It’s those little, round black seeds, that kind of looks like very small dragon eggs (to me, anyways). But chia seeds are not only cool looking, and have a weirdly amazing ability to soak up liquid and turn themselves into vegan eggs, chia puddings or other fun stuff, they’re also incredible for our health! Many people worry you will lack essential nutrients by going vegan. And it certainly is a possibilty, if you don’t do some research about what plant sources to get the different vitamins and minerals from. Once you’ve done your research, you should be able to meet all your nutritional requirements, as a vegan, without too many complications (except for B12, which I can talk about later). 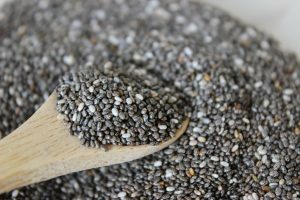 In this post I will talk to you about the wonders of chia seeds, and how they help me get some #extrahealth and nutrients into my day. The #extrahealth category is a place, where I will give you tips and information on how to easily become the healthiest you! As you can probably tell from the title, I eat chia seeds fairly often. I might not eat them every single day, but it’s close! 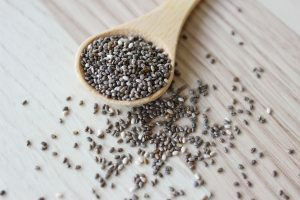 One of the main reasons, why I eat chia seeds, is for omega-3 fatty acids, so on days where I don’t eat them, I’ll normally get it from another plant source, rich in that essential nutrient, such as walnuts, flax or hemp seeds. But I’ll tell you more about that in just a minute. It’s easy to incorporate chia seeds into your diet. Usually I eat my daily dosis with my breakfast, but you can really eat them at any meal you’d like! But now let’s get to the reasons why chia seeds really are such a big deal. As I mentioned before, chia seeds are an excellent source of omega-3 fatty acids. They’re actually one of the best plant sources of the omega-3 fatty acid ALA, which the body can use to convert to EPA and DHA, all essential nutrients. To get enough ALA from chia seeds for your body to convert into the other omega-3 fatty acids, you will need about 8 tablespoons. That can sound like a lot of seeds, but chia seeds are still are good source of omega-3! Chia seeds have a high amount of antioxidants in them, which can help prevent the sensitive fats in them from becoming rancid. Antioxidants can also help slow down aging, and protect you against degenerative diseases of aging, such as cancer. Just one tablespoon of chia seeds will give you 5 g of fiber! Why is fiber beneficial? In your large intestine there is currently living trillions of bacteria. This is not bad, since the bacteria help taking care of some things your body cannot do. Like all other organisms, your little bacteria friends need to eat! This is where fiber comes into the picture. Most carbohydrates, proteins and fats get absorbed into the bloodstream before they make it to the large intestine. But our bodies does not have the enzymes to break down fiber, and therefore fiber reaches the large intestine relatively unchanged. The good bacteria can break down fiber. And when you feed it to them, your level of good bacteria is raised. The bacteria help produce nutrients for your body, so that is great! And chia seeds are 40% fiber by weight, making them one of the best sources of fiber in the world. Chia seeds are rich in several nutrients that promote good bone health. These include calcium, phosphorus, magnesium and protein. Just an ounce (28 g) contain 18% of your daily recommended intake of calcium, impressive! By gram, that is more than most dairy products. They’re easy AND tasty to add to your diet! You can add chia seeds to pretty much anything, because their taste is mostly bland. They don’t have to be ground, like flax seeds, which is great. As I wrote at the start of this post, I usually eat chia seeds with my breakfast. But the possibilities are endless! You can eat them raw, mix them with porridge, add them to baked goods, sprinkle them on top of smoothies or other meals, and, my favourite way to eat them, soaked into a pudding! You can also let them soak in water, to become a gel, and they will function as an egg replacement in any recipe. I just had chia pudding this morning, actually! I hope you enjoyed this post and learned something new about the little chia seeds, and how beneficial they are to our health! I’m planning to write about maca powder pretty soon. If you have a certain food, you would like to know more about the health benefits from, feel free to leave a comment.